One Of the Highest Kills in Game 200KT and counting! 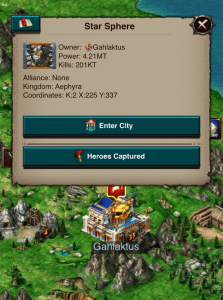 InsideGameofWar recently had the chance to chat with Nic aka Gahlaktus about his achievement. What is your current kill count? How long did it take you to gain these kills? Did you make a concerted effort to get to this number or was it a bit of a surprise to realize how many you had? As the game advances, the amount of kills you can make per drop increase for sure. Before the Mega-Merge event I was sitting at 30kt kills and I was able to pass 100kt post merge event. Since that I hit 150kt and then 200kt just yesterday! It was definitely a concerted effort to reach the kills I am at and I have an amazing team behind me that has supported me in my endeavor. What factors in today’s game of war do you think contribute to the rise in kills from each rally? Recently, kills have been out of control. If you can pick and prioritize your targets you can rack up kills pretty quickly. With the game updating weekly if not twice weekly, many can be caught off guard on a drop night. The new concept of an out of reach “ceiling” so to speak can give an edge to a player who can get to those higher hero levels and vip’s. I pushed my hero on Gahlaktus to 111 and my VIP to 62 last week and I was finding that I could solo burn targets that were capping rallies from other “max” accounts. What is your preferred gear to hit and to hit in? Full set and economy gear is always the most fun to hit. The game is a little more complex right now with huge hidden values that can’t be seen. The new economy leg of the research tree is devastating from an attacking standpoint but also has huge defensive value. Traps with this new research can stay small and appear outdated which makes them attractive. Right now the people that scout with me look for targets in the mid range hero levels. If someone has hero 60-102 they may be more trappy than someone with hero 103-109. If a player went to hero 109 I assume they stopped buying before the last hero level and ultimately probably does not have new research. Kunai targets are always scary but if they are outdated and do not have the stats to back them they usually can burn really nice. Knowing what boosts to swap for different gears maximizes your chance to burn a target. I always try to burn the newest set of cores as they yield the best stats. The new core is very interesting. I noticed that the full set has slightly higher attack, specific defense debuff and marginally higher health debuff as opposed to the 4 piece set with 3 Athena Rings. The full set however has a significant loss to overall defense debuff compared to 4 piece 3 rings. I have been using the full set to hit kunai’s and heroless targets and the 4 piece set with 3 rings for 2 kunai/1 kunai and full sets. Any other tips you may want to share with others in terms of what things to look for in a target? Target finding is an undefined science. There are so many variables that can’t be seen on the face of a stronghold. I try to seek out targets that are outdated yet not too good to be true. The obvious indicators are gear, hero level, vip, kdr, troops lost, kills and graveyard. Usually the people that scout with me and I make a list of at least 5 or more targets, prioritize them and hit each one from best chance to burn to worst. This has been successful for me in the last month. With ancient teleports so common now it is fantastic to scan a kingdom and run 2 or 3 sets hopping from target to target. Heroless and hero out targets usually yield the best solos and rallies. I usually bookmark or hold onto all alliance gift tiles even empty ones. There are many players that still farm and often they get complacent and put their hero on the tile. Porting off screen and taking the hero for a quick solo usually has great results. It can be beneficial to have a trap or to know a good trap that can travel with you to bait heroless targets. I have done this with Chickow who has an excellent trap. She will port near a wonder with no prison and bounce bigger players so the smaller players and lower hero levels get comfortable and then reconstruct the prison when they solo or rally. I have had some massive solo and rally hits from this. I always sit off screen and speed my solo in as soon as the hero is captured. Do you have any other goals to achieve in game or are you just having fun smashing? Honestly the reason I play this game is for the community. The people that I play with are amazing and tons of fun. We always have a good time smashing together. I would have left a long time ago if it wasn’t for the core group of people that stand with me today. Did you want to give a shout out to anyone? Where I am at today wouldn’t be possible without the people that have helped me. I have an amazing team of people that help me find targets and who keep my account running when I am unable to. Firstly I have to mention Chickow who is to this date the greatest scout in GOW. Her ability to find targets is incredible. She also has recently taken up trapping and this has allowed me to hit targets that she captures. Chick is a great friend and is always there for me when I need her the most. I have to shout out to RoxyRica. Roxy one of the best scouts I have ever seen. The things she finds sometimes I cannot believe. Beyond her amazing scouting ability she is an excellent lead. I have learned many things since getting to know her. She has driven my account on many occasion and has found and hit some amazing targets. The combination of being able to find your own targets and also lead on them makes Roxy’s gameplay impeccable. Chels AKA Chelsea has been a long-time friend and has helped me find targets for many months. She is an amazing trap and has a keen eye for finding things that burn. Chelsea has been an extremely valuable and appreciated team member for many months. When I first began playing GOW I started in the protected kingdom of 864 it was there that I met BigManBrian as a small low power player. At the time he was the King of the kingdom. Brian taught me how to start leading and helped me grow since the beginning. I wouldn’t be where I am today without Brian’s help. Today, Brian helps me scout and find targets along with my team. He is very knowledgeable and an integral part of this team. When I moved kingdoms from 358 to 765 I met 187Princess. Princess is a crazy good scout. She isn’t just the normal type of scout that finds the obvious burns, Princess will post outlandish targets with big power or high hero levels and confidently tell you to burn them. Most of them end up zeroed. Princess enjoys the science of going through stats and gear and pushing the limits of what will burn. Some of the biggest burns I have accomplished are because of Princess. Narfran has been a scout since I first got to know her in my home kingdom of 864. Narf recently followed me from 864 to 765 and helps me daily to find things to burn. She’s always around during drop time to scan for targets that aren’t ready. The newest addition to my team is Mellow. Mellow comes from raGe alliance as a lead and scout. She has been a key part of this team in recent weeks constantly posting cords and has been very active in finding targets. This group of amazing people are the foundation of my success and I am very grateful to have them as friends and teammates. Love you guys! We thank Nic for the time he spent chatting and answering the questions. Congratulations again! Maybe this bug would explain how someone can 1 hit Massive Defeat a city with 900B top teir troops and a power of 70TT with only 1.43B troops and 656M traps. All his troops and traps died and none of mine died but they all went to the hospital. FlamingMo just passed 5MT kills. Oh and power destroyed doesn’t mean anything because stats reset after 10MT. BB was the top killer when this was written. This fag would attack his own kingdom during a Ke to get his kills up. Don’t believe the fake stats. Yeah. I’m pretty sure a few people passed this guy today just sending heroless marches. You should be looking at kills right now, solo marches are zeroing 150kt plus accounts in one hit, it’s happening all over the kingdoms, so obviously a bug that a single march can destroy an account in one hit when rallies can barely touch it, not mine btw sitting in a 30 day shield. Yet no mention of this on any game sites I’ve visited and MZ not saying a word yet hundreds of accounts being destroyed by this bug/exploit. If any game sites do any investigative work please do and hold MZ feet to the flames to fix things and compensate players affected. wow BB is salty af ? After all posts and proof people seriously said BB? She is known for padding kills in the past. And Gahlak just another dumbass burning money as soon as there’s a new release for pixels. There’s screenshots, proof, videos of her padding kills in the past. Hence why I’m pretty sure they left her out. That is not true… get your facts straight ? hmmm thats funny af would love to see the proof when its never happened.. lol haters gonna hate! He cant show any proof cause there is none ? Bb doesn’t pad kills ? She probably zeroed him why he salty ? Fuqed By BB has been over 200kt as declined said learn your facts ??‍♂️? Fuqed By BB aka BHoleBlaster has had over 200KT kills way before Gahlaktus hit 200KT he was still at 193KT when I had 209KT and have a screen shot to prove it we were in same kingdom at the time.. If you gonna say someone is the king of kills get your facts straight before your put out an article on him. P.S. the REAL KING OF KILLS!!! Yeah close to 9mt PD and rising quickly. LoL they changed the article name for a reason because they knew they were wrong.